That's it... Lara is now properly excited about Christmas. Every morning on the way to nursery she tells me, "it's nearly Christmas" and it makes me smile. We've put up Lara's advent calendar ready for the 1st December and we've already pulled one or two crackers (much to Lara's delight) and, as you know Lara and I have been practising one or two Christmas recipes for our annual Christmas Party. This children's father christmas apron was an inspired choice for Lara, my little cook. This weekend Lara Christmas will be helping me trial a snowball cupcake recipe and gingerbread biscuits. Lara's Peppa Pig advent calendar and mini children's crackers also came from Poundstretcher. The calendar is just as good as any you would find anywhere else and the crackers make a cute addition to a kid's stocking (I wouldn't put one on the dinner table though as they don't have hats in them!). If you are looking for wrapping paper, decorations, confectionary or stocking fillers over the next few weeks you could do worse than pop into Poundstretcher to see how far your budget could take you. Even before I became pregnant, some of my readers asked me exactly this question. 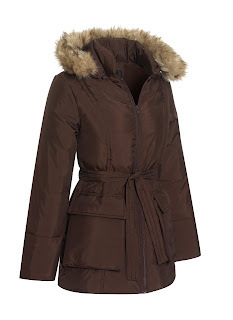 Where can I buy a winter maternity coat? 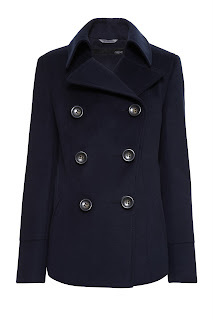 Lots of places sell T-shirts, jeans and dresses but coats are harder to come by so I decided to put together a list of a few lovely winter coats that I've found over the past weeks (I've not decided which to buy myself yet though! ); hopefully I've covered all tastes and budgets! 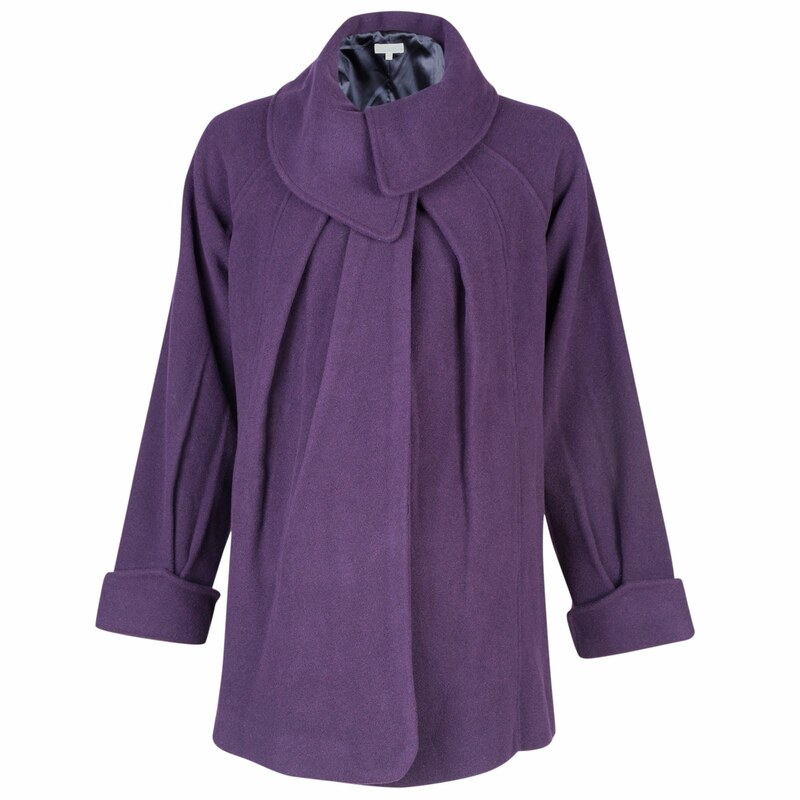 Jojo Maman Bebe have a really affordable range of maternity clothing and a good few winter coats in the range. Isabella Oliver have a very smart collection of maternity coats including this miltary-style cashmere mix coat in a number of colours. Blossom Mother & Child stock a scrumptious range of luxury maternity wear including this selection of beautiful winter coats. Today I'd like to introduce you to a local lady called Maddi who runs D&M*R Yum-ee Dum-ee, a hobby business making functional and decorative (and most importantly, SAFE) dummy clips. As an expectant mum-to-be, dummies and dummy-related gadgets are just coming back onto my horizon as you can tell from this morning's review. Maddi handmakes all of her dummy clips and is passionate about finding new and exciting designs - she stocks a wonderful array of ribbons and can make designs up to order as well as the items she has in stock. I really love some of the themed designs for Christmas, as well as the character designs such as Peppa Pig. The dummy clip we tried really was very sturdy and it would take some mean feat to pull the dummy from it once attached. 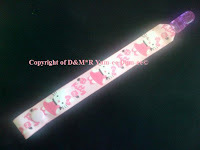 Yum-ee Dum-ee Clips are handmade using durable ribbon, plastic clips and snap fasteners that are sewn into place. 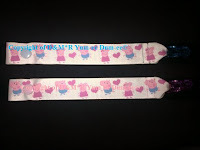 All ribbon is heat sealed and heat bonded to prevent fraying. I use a sewing machine to make sure stitches are secure. 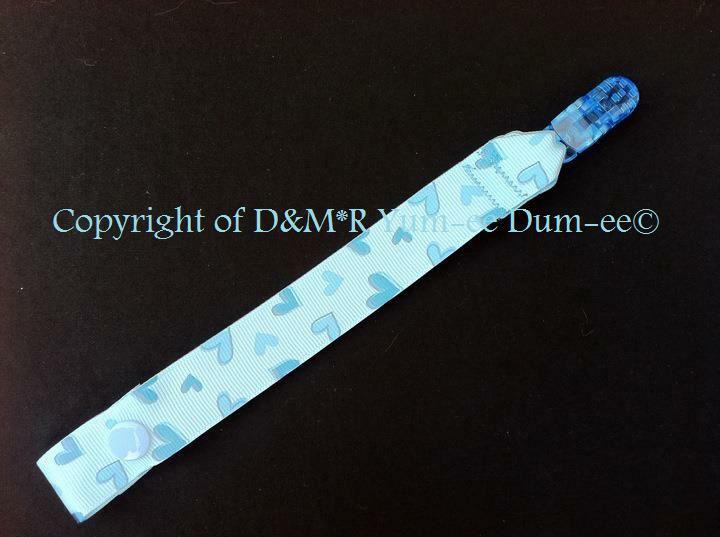 The plastic clips are kinder to clothes than the metal ones many other brands use and because there are no beads or embellishments on the dummy clips, there is a reduced risk of choking and entanglement compared to others on the market. You can buy Yum-ee Dum-ee clips with a traditional clip fastening or the specialist MAM clips to support MAM soothers. Maddi's dummy clips cost from £2 to £3. 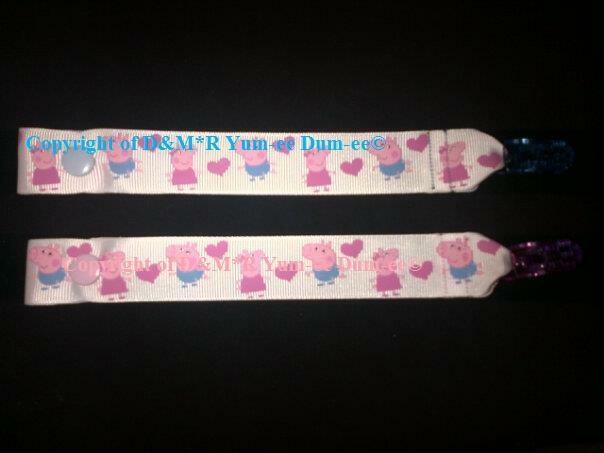 You can find out more about Yum-ee Dum-ee clips on the website or on facebook. This week I've really noticed my bump grow significantly. I'm not going to put a picture up yet as I'm saving that for a day when I'm properly into my 'blooming' stage! Now I'm finding that I can no longer wear most of my T-Shirts without a rather inelegant bulge so I'm going to be browsing all of the maternity fashion sites - I heard this week that Glow maternity & baby (which is where I bought most of maternity clothes from the first time around) have launched their own GLOW maternity label. Another pregnancy side effect this week is a total aversion to the contents of the potty. Lara is doing so well with the toilet but every time I have to deal with the contents of a potty rather than a trip to the toilet, I find myself wretching and so we've had to invest in a carpet cleaner not only to deal with Lara's accidents on the carpet, but my vomit too! I've also noticed the 'baby brain' start to kick in. Several times this week both at home and at work I have started doing something only to realise I have no idea what I was starting to do. My short-term memory is shot and I think its time to start bringing out the lists again (mind you, I never really stopped making lists after the first pregnancy). At work this is really hard to deal with because now I am in a position of authority, it looks a bit amateurish if I have to ask someone to remind me what I was doing. I've decided that the best course of action is to do something else and not to worry about it - usually 10 minutes later my brain suddenly kicks in and I remember what it was. This past weekend Lara and I were invited to the OXO tower in London for a very special meal. 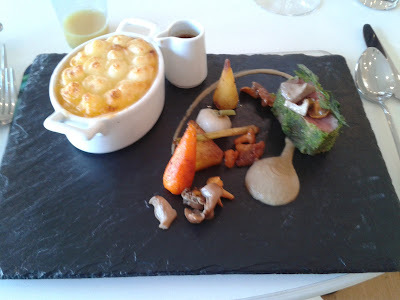 Fairy Platinum invited us to enjoy a meal cooked by Michelin-starred chef, Michael Caines (a personal her of mine) for free but with one big caveat... we had to wash our own dishes up afterwards! It seemed like a reasonable deal to me. Michael Caines is an understated celebrity chef who runs, among other restaurants, Gidleigh Park in Devon. For just two days this month Michael ran a pop-up restaurant at the OXO Tower serving a limited menu. Myself and Mr. B actually met Michael the weekend before as part of a prize experience at the Masterchef Live; he cooked some mouth-watering dishes and seemed like a friendly, down-to-earth sort of guy (I even managed to help him with his wireless connection, that's how much of a geek I am). To really put Fairy Platinum cleaning products to the test, Michael cooked a range of dishes which included Shepherd's Pie and Sticky Toffee Pudding - guaranteed to leave nasty dishes to clean. Both Mr. B. and I took the washing up challenge. I managed to clean my dishes by hand in just over 25 seconds which I thought was a pretty awesome time but in the end I was beaten by a massive amount. Sandy from Baby Baby won the challenge in around 15 seconds. Mental. For her efforts Sandy won a year's supply of Fairy Platinum washing up liquid and dishwasher tablets. On the train home from the OXO tower I read through all of the marketing bumph about Fairy Platinum which claimed that with the washing up liquid you could get the effect of an overnight soaking in just 10 minutes... hmmm. That evening I cooked sticky barbecue chicken wings in the oven and the following morning I thought I'd put Fairy Platinum liquid to the test on the dirty dish. In 10 minutes the dish didn't come immediately clean but most of the burnt-on sauce came off and I knew that it would only need to go through the dishwasher once to come completely clean - it turns out that the Fairy marketing people weren't away with the fairies when they dreamed up their bold claims! Wordless Wednesday - Guess the name of my new team at work? I shan't patronise you with a recipe for crepes or pancakes (although if you are looking for a recipe you could start at the BBC), in fact, I am a bit embarrassed to admit that our crepe mix came from a packet we picked up at Masterchef Live!!! No, this blog post is more about introducing a toddler to a frying pan and to cooking on the hob; something I have been plucking up courage to do with Lara for some weeks now. Quite understandably, most children's cookery recipes suggest that the responsible adult takes charge of most of the actual 'cooking'. For this reason, children's cookery tends to be centred around baking - cookery that involves quite some prep, but very little interactive cooking. For me, food is about a lot more than cake so I want to introduce Lara to the cooking part as well as the prep. You don't introduce a preschooler to cooking on the hob without some trepidation. It requires confidence, co-ordination and a second pair of eyes (hence Mr. B. lurking in today's photos). We chose to cook pancakes in Lara's brand new frying pan all of her own - it is a Tefal Sensorielle omlette pan which was sent just for her to review - it has an astonishingly strong non-stick coating and a high-resistance base so it is great for low-fat cookery without butter or oil and is ideal for standing up to the test of a toddler with a pallete knife. Not only did Lara love devouring the pancakes that she had made with her own hands, but I came away from the experience with a great feeling that Lara had learned some respect for the heat and the flame of the hob; she learned to watch for the red spot in the middle of her pan to indicate that it was hot enough to cook, and learned to slip the pallet knife around the pancake in order to losen the edges. Lara managed to get up close to her food being cooked and is taking the first steps in learning the art of cookery. We were kindly sent a Ben and Holly's Little Kingdom Magical Light and Sounds Tri Scooter to review by Entertainment One. Lara is a massive Ben and Holly fan and this brightly coloured scooter (designed for pre-schoolers from 3 years) is the stuff of dreams for Lara. 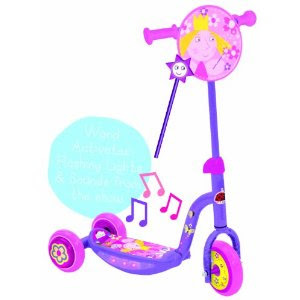 Described as a "Magical tri-scooter featuring lights and sounds from the show activated by Holly's magic wand! Includes fun character plaque and graphics", I had high expectations. I was disappointed that the scooter came in so many different pieces that needed to be assembled - after over half an hour with Lara constantly pestering, and several arguments with Mr. B, we managed to assemble it using our own tools (we gave up on the tools provided); I was thankful we hadn't had to undergo that pressure on Christmas Day! The scooter is quite sturdy to use and is ideal for younger children as the tyres can't puncture and the scooter has two wheels at the back to keep it stable. You can adjust the handlebars to the height of your child. We felt that the quality of the stickers on the scooter was poor; some were peeling and the main graphics on the front panel were blistered. We thankfully managed to find a batteries for both the scooter and the separate wand (that I am convinced Lara will lose in the very near future). The battery for the wand isn't a size we would normally have in the house. When Lara presses the button on the wand, the lights and sound on the scooter activate. A series of red lights flash and Holly says a few magical words. The instructions say that you have to be within 1m for it to activate but we've found that Lara needs to hold the wand within about 15cm. The quality of the sound could be better and I would have hoped the lights and sound to still work when Lara does (eventually) lose or destroy the magic wand... they won't, which means that at this point, the lights and sounds become unusable. To try and prevent this you can store the magic wand in it's holder at the front of the scooter. Despite all this, I still think that the Ben & Holly scooter brings Lara smiles when she is using it and, at nearly half the price of a micro-scooter it is a cheaper option for a pre-schooler scooter. The quality issues I've found with it mean I don't think it is great value for money but it will bring smiles to many little girls this Christmas. The Ben and Holly's Little Kingdom Magical Light and Sound Tri Scooter costs around £39.99. Ben and Holly's Little Kingdom products are available at all good retailers. Find out more about Ben and Holly's little kingdom on the official facebook page. Regular followers will know my quest to find skincare products for Lara that don't irritate her skin. As a baby we did find a few products we tried and loved but as Lara grows older her needs change. These days I'd describe her skin condition as 'dry' and 'irritated' rather than as ezcema. As an active toddler she now gets pretty grubby at nursery and in the garden so she needs REAL products, not baby products to keep her skin clean but moisturised. 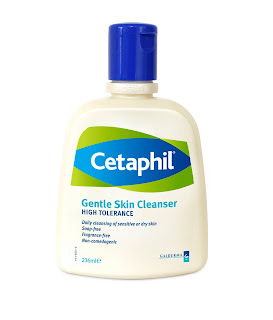 For the past month we have both been reviewing Cetaphil skincare products to see how they suit our skin. Although the thick Cetaphil Moisturising Cream seems ideal for Lara's skin, and the thinner Cetaphil Moisturising Lotion is perfect for my skin; it is the cleansing product's from Cetaphil's range that have most impressed me. This cleanser is suitable for the face or body. I wouldn't use it on Lara because its packed full of alcohol, parabens and SLS but for me its fine. It's great to have a soap-free alternative to the daily face-washes that I normally use because it is less drying on my skin. You can use this gentle skin cleanser from Cetaphil as you would a traditional facial cleanser or make-up remover, wiping it away after use. Alternatively you can rinse it off with water (which is what I've tended to do as my skin feels cleaner after use). At present my skin has a natural pregnant glow to it and is pretty much looking after itself but after the pregnancy I can really see myself relying on a sensitive skin cleanser like this to bring me back from the post-hormonal brink. 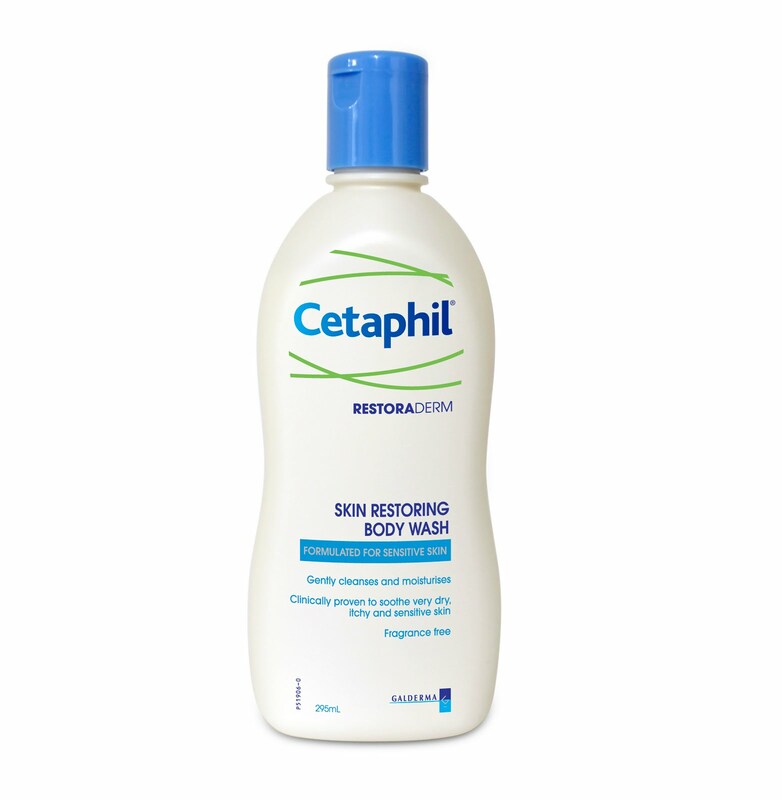 The Cetaphil Restoraderm body wash is what we are currently using on Lara's skin at bathtime. It is suitable for all skin types but is specifically designed for those with dry, sensitive skin or with ezcema. It looks like a milky lotion but actually does provide a light lather when you use it. The bodywash is fragrance free which is disappointing for a toddler but it something I am coming to terms with in terms of caring for Lara's skin. The thing that i really like about this bodywash is that it really does leave our skin feeling soft and moist afterwards and yet it does also feel clean. Usually, when I use one of Lara's specialist bathtime products, they leave an oily feeling on my skin (yes, I know that is the point, but its not a feeling I enjoy). This one doesn't leave that greasy feeling. I'm really happy with the effect that the Restoraderm bodywash has had on Lara's dry skin on her arms and legs. Cetaphil can be bought from Boots and other large pharmacies. Other than suffering with a cold, this week has been pretty uneventful. I had forgotten how much like hard work a cold during pregnancy is. I had a routine appointment with the midwife this week and we got a chance to listen to the baby's heart beat. Using a fetal-doppler, the midwife tried to tune into baby's heart but it kept jumping all over the place - this is a VERY active baby! I also had my standard blood pressure and urine tests - it's all glamour in the life of a pregnant lady. This week I have been suffering from the three C's - a cold, congestion and the resultant cough. Poor little Lara has been suffering too, with a fever to boot. In the past I would have tanked myself up on decongestant tablets or night-nurse and hidden away for 24 hours to get through the worst of it, but during pregnancy there are few effective congestion medications you can take so I have been extremely thankful for my Sterimar spray. 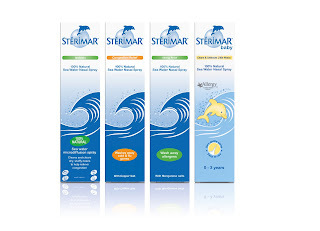 You may remember that I first discovered Sterimar Baby this summer when I reviewed their natural seawater nasal spray for babies and young children. Towards the end of last week, when Lara's cold was at its worst, we really got a chance to test the Sterimar Baby spray. The effects were so good that I decided to try one of their adult products myself. 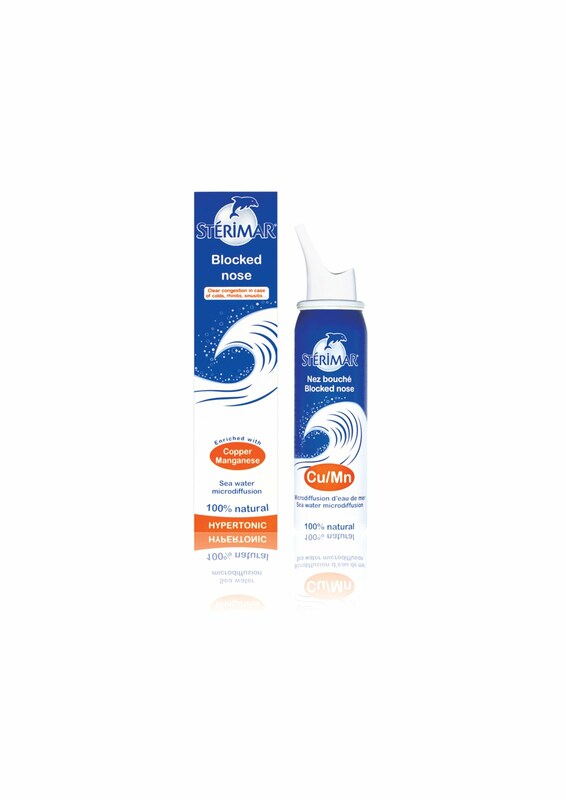 I have been using Sterimar Congestion Relief which is also a natural seawater spray with a high salt concentration so it really helps to unblock my nose and relieve the symptoms of congestion in my nose. Because it is simply 100% natural seawater and has no known side effects, it is a great remedy for me as a pregnant lady but I can see myself using this as a non-medicinal remedy many times in the future too. I've found it to be most effective last thing before I go to bed, which is when I suffer most with a blocked nose. 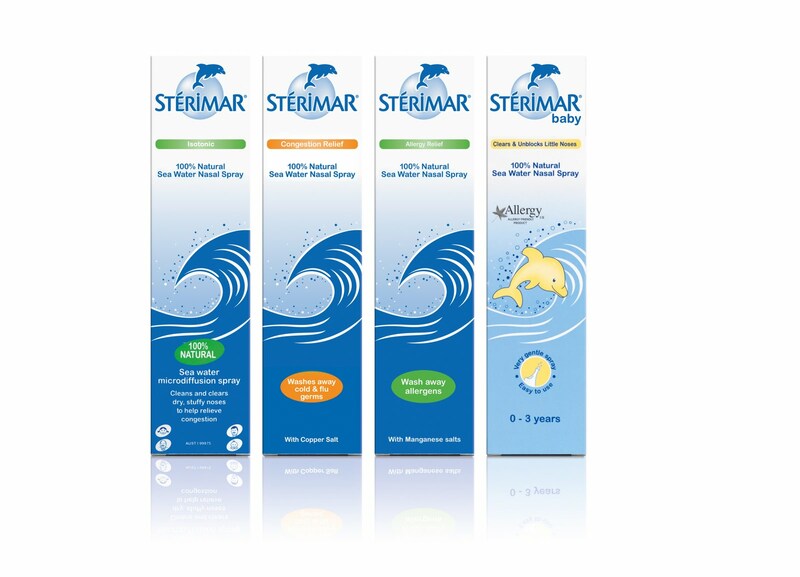 Lara's Sterimar Baby spray is a much more dilute spray that is suitable from birth. A baby or toddler really just doesn't understand what is happening when their nose is blocked and it is so hard for them to communicate their inability to breathe. At several points over the last week Lara has screamed and screamed herself into oblivion because she has had a blocked nose. It has taken quite some doing to get the nasal spray into her nose past the flailing arms, screaming mouth and upset tears but within minutes of using the spray, Lara has calmed down. It feels so good to not have to turn to the medicine cabinet unless Lara actually gets a fever. You can find out more about Sterimar at www.sterimarnasal.co.uk. 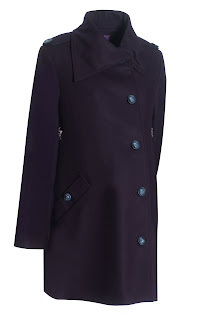 This post was written as part of the Sterimar Ambassador Scheme for which I was re-imbursed. I stand by all of the statements in this post and wouldn't have elected to become a Sterimar Ambassador if I didn't genuinely rate the product. Lara wasn't feeling well this weekend so I decided to cheer her up with a bit of baking! We have been getting into practice for Christmas and testing out some of the cake decorations that I bought at the weekend at Masterchef Live! Soften the butter and then cream it into the dry ingredients until it looks a bit like wet sand. 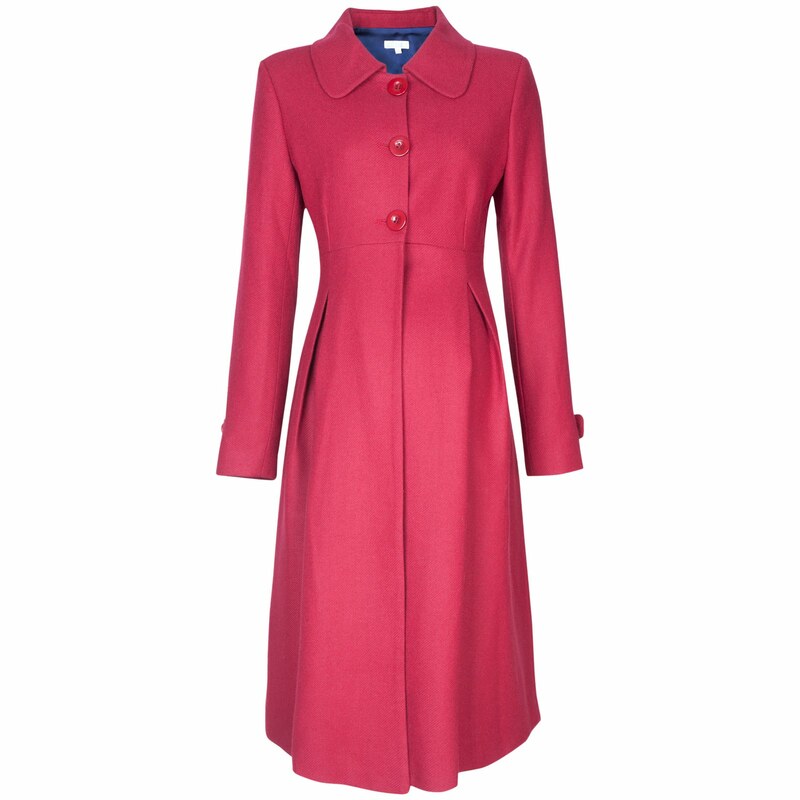 I am a catalogue addict. I admit it. I love browsing Christmas catalogues and when the Handpicked Collection Christmas catalogue plopped through my letterbox, I spent hours turning the corners over for all my Christmas gift ideas. the Handpicked Collection sent Lara a Hammer & Balls lorry to give us an idea of the quality of their gifts - it worked because I have since been back and ordered 3 other Christmas pressies for family members. 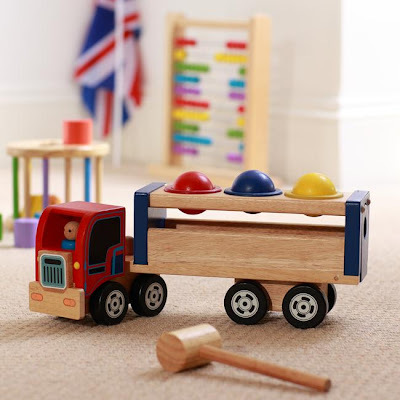 The Hammer and Balls Lorry is a wonderful wooden toy suitable for ages 2 upwards. I think it would probably be fine for younger children except for the fact that it does take quite some effort to hammer the balls through into the lorry - hence lara's rather strange hammering action in the photo above! As with many wooden toys, the quality and finish is fantastic and it is the toy's simplicity that makes it so appealing. At present, the wooden lorry from the Handpicked Collection is one of the first toys that Lara likes to show off to guests (the other is the Innotab which makes for a fascinating combination of simple/advanced traditional/modern). The toys is completely made from wood apart from the little rubber rings around the holes that you hammer the balls into. As you hammer the balls down into the body of the lorry they collect and then, when the lorry pulls away, the weight of the balls opens the back door and they all roll out onto the floor (causing much hilarity... time after time!). Lara quite likes to play with the lorry on her car mat as it has fully functioning wheels. As you have probably gathered by now, the Mellow family like to travel. In the UK and abroad, I like to think that our travels are no less adventurous now that we have a toddler than they were before Lara came along. We are already planning our first trip away with baby number two to Cyprus for a wedding next summer. Travelling With Children is a website that sells all of the little bits and bobs that makes travel with kids that little bit more bareable. Travelling with children has a wide range of travel products from swimwear, sun protection, waterproofs and baby slings to car seat accessories, safety equipment and name labels. Alongside the catalogue of products there are also a small number of pages along the right-hand side of the site that offer tips and advice for common travel conundrums such as packing, dealing with traffic jams and basic first aid. I shall be totally honest and say that I find the appearance of the website to be a little old fashioned - it reminds me more of somewhere I'd book a holiday rather than prepare for it. I also found the search functionality on the site to be a bit suspicious... it correctly identified the products I was searching for but when I tried to navigate to them, the pages it took me to were either wrong or empty. That said, the navigation though menus and categories worked fine and I managed to find what I was looking for. 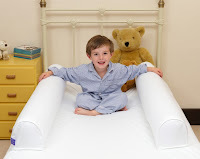 We reviewed two items from the Travelling with Children range. 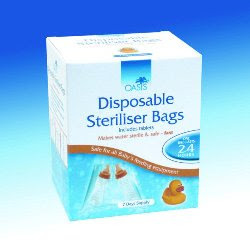 First up was a set of disposable sterilising bags for cold-water sterilising. I found them very easy to use and will definitely be taking some of these to the hotel in Cyprus next year for bottle or breast-feeding gadgets. In the past I have been caught out with microwave and electronic sterilisers in countries which don't share the same voltage or in accommodation that doesn't have a microwave. These bags don't need power - just tap water. 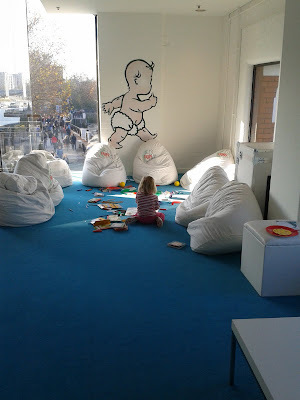 We also tried out the Toddler Mini Backpack and Reins which recently won a Mother & Baby award. 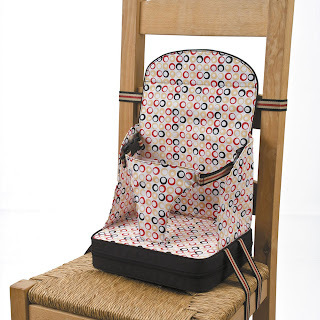 It is a really good sized backpack for a toddler that could actually hold some useful stuff. The rein for the parent to hold attaches easily to the bag so that it can act as a set of reins. One of my favourite parts of the backpack is the little reflector on the back as this has prooved useful during the dark evenings recently when Lara has legged it off in a different direction to me! There is a little sheep and big embroidered on the bag - they look a bit lame and I think I'd prefer it without this addition. The cold water steriliser bags cost £12.99 for 7 bags and the mini backpack and reins costs £15.99. This week I met my maternity consultant for the first (and probably last) time. I had been referred to the consultant for two reasons; the first being that I had a 'relatively' complicated assisted birth experience with Lara who at 8lb 12 was 'relatively' large. Nothing out of the ordinary, but enough for my midwife to feel that I needed to be referred. The second reason for referral was the series of gyno- and non-gyno- issues that I experienced in the 6 or 7 months following Lara's birth which have put me off the whole idea of childbirth this time around. The consultant obviously felt I was wasting her time and pointed out to me that 8lb 12 is a small baby and that most women experience complications after birth; she tried to point me towards the door. I looked at her blankly and asked why the midwife would have felt it necessary to refer me and her answer was that she probably has misunderstood my symptoms. She rushed through my notes and entirely missed the bit which documented that a cyst had been discovered at the first scan (she grudingly agreed to a blood test) and that there was a history of diabetes in the family (she signed me up for a glucose tolerance test) and then sent me on my way. Maybe I had invalid expectations - I was expecting to be able to talk about the birth options available to me, and to receive some sort of comforting offer of support through what would hopefully be a less traumatic experience this time around. Er. No. In other news, I've been really suffering from insomnia this week. I was a little unwell at the weekend and it caused me to wake up in the night for several days - after waking, I just couldn't get back to sleep. It's rubbish to be awake at 4am when you have a full day at work ahead of you. At the weekend we took Lara to Toys R Us for the first time since she was a tiny baby. It was an impromptu visit (we were supposed to be looking for a comfy chair for the nursery) but Mr B. and I decided it might be a good idea to take Lara into a toy shop so that she could give us some ideas of what she might like to put on her Christmas list. The look on Lara's face as she browsed the shelves was heart-melting. An enormous smile spread from one cheek to another and her eyes were WIDE open. After she had got over the age-old toddler trick of pointing out all of the things she already owned (! ), Lara really got into her stride. Rushing from one side of the aisle to the other, grabbing things from the shelves to take a better look. Lara was remarkably well behaved. I think she was a tad overhwelmed to see so many exciting toys all in once place but never once did she beg me to buy something. At one point she did try to insert 'Gator Golf' into my hands but she seemed satisfied when I explained that she could write a letter to Father Christmas to ask for the game. Now, because Lara had never experienced Toys R Us before she didn't know any better when we finally left empty-handed. Perhaps all toy-shopping experiences should be like this? In fact, in a world where mummy does almost all of her shopping online, I could 'probably' get away with empty-handed toy store shopping for quite some time, couldn't I?. Are you able to resist the temptation to buy presents when you see your child's face light up? During pregnancy, your body (and your baby) puts some very unusual demands on you nutritionally. I'm not someone who ordinarily takes food supplements but during pregnancy, I'm aware that there are one of two areas of my diet that could do with a helping hand in order to give my baby the best possible chance in life (for instance, I have a diet very low in fish) so during this pregnancy I've done a little research into some of the different pregnancy supplements you can buy, and the benefits they offer. 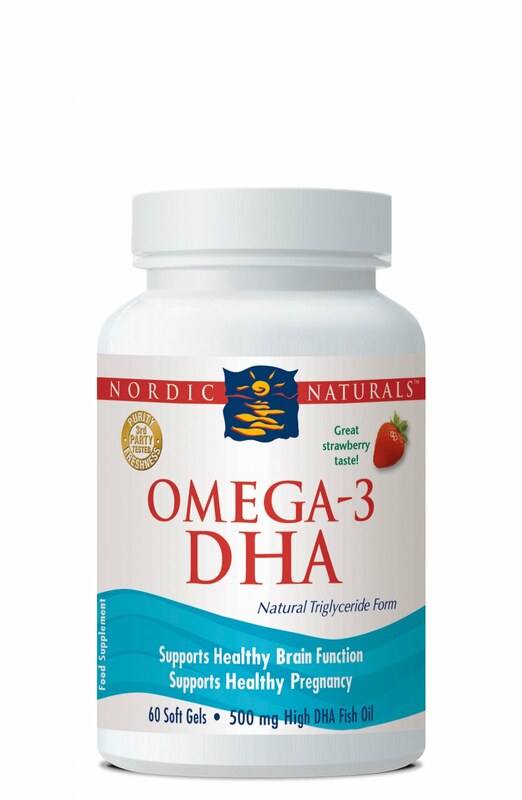 What they say: DHA is an essential fat for maintaining cellular fluidity and supports memory, cognition, and emotional well-being. These delicious, strawberry-flavoured soft gels are half the size of a standard soft gel, making them easier to swallow. What Mellow Mummy says: Perfectly fills the fish-oil gap in my diet. The strawberry smell was overwhelming when I first opened the packet but it has calmed down since. Two tablets a day is a bit annoying, but I'd rather that than a gel that than a huge one that got stuck in my throat. Buy From: Chemists and health stores (find one on the nordicnaturals.com website). 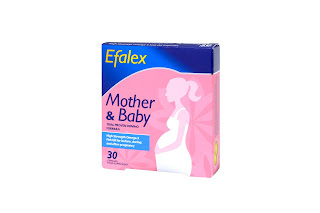 What they say: Efalex mother & Baby is a fish oil supplement specifically designed to replenish essential fatty acids for expectant mums whose stocks are naturally depleted by the demands of the growing baby. During the last three months of pregnancy there is a rapid accumulation of DHA and AA in the eyes and brain cells of the foetus and after birth, breast milk supplies the essential fatty acids that are required for your baby to continue development. What Mellow Mummy says: Pleasantly fragrance and taste-free (I was expecting the worst from a fish oil gel!). Foil casing means they don't stick together. I can picture myself taking these well beyond birth. 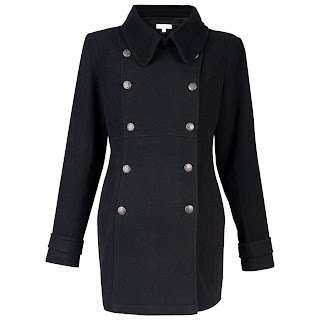 Buy From: Large boots stores for around £8.99. What they say: Handy pocket-sized spray with a calming peppermint taste that quickly tops up essential nutrients directly into the bloodstream to ensure none are lots through illness or through digestive transit. Provides vitamin D3 which is believed to reduce the risk of premature labour. Also contains folic acid, B1 and B6 to maintain normal development of the baby's neural tube and nervous system. What Mellow Mummy says: An oral vitamin spray is certainly different - it means I can keep it in my bag without rattling! You have to take several 'sprays' a day so I distribute them throughout the day. The peppermint taste is STRONG and the feeling of spraying it under the tongue takes a little getting used to but the combination of vitamins it provides is a great starting point. Buy From: www.betteryou.uk.com from £9.99. What they say: Sanatogen Mother To Be is a multivitamin and multimineral food supplement, which provides essential nutrients needed before and during pregnancy, including the recommended daily amount of Folic Acid. 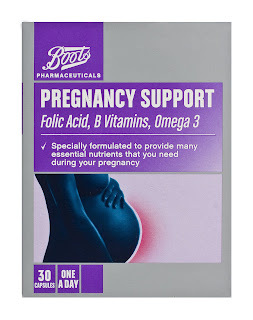 What Mellow Mummy says: A good all-round pregnancy supplement that provides me with most of the things I need during conception, pregnancy and beyond. I think I would be even more tempted by the Sanatogen Mother to Be + Omega-3 version as then I would have no need to take folic acid OR DHA tablets in addition to this. Buy From: Supermarkets and pharmacies. What they say: Boots Pharmaceuticals Pregnancy Support (Folic Acid, B Vitamins, Omega 3) is specially formulated to provide many essential nutrients that you need during your pregnancy. What Mellow Mummy says: An all-in-one pregnancy supplement that provides me with most of the things I am currently missing in my diet. The tablets are pretty huge and uninviting but they are foil wrapped to keep them separate. One of the more expensive supplements I have tried. Buy From: Boots (in store and online) from £9.19. What they say: Developed for women during conception, pregnancy and throughout breast feeding. 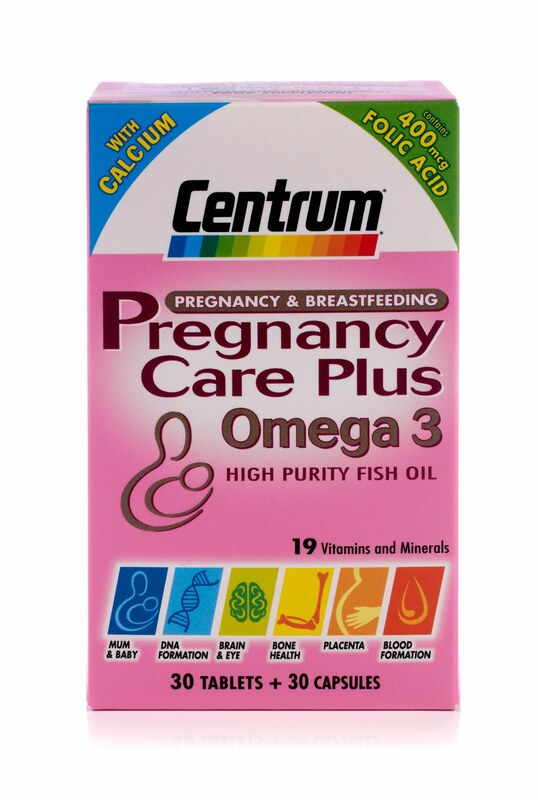 Centrum have now developed Centrum Pregnancy Care and Pregnancy Care Plus with Omega 3 containing a unique blend of 19 vitamins and minerals including folic acid to support healthy foetal growth and help the baby's bone, brain and eye development. 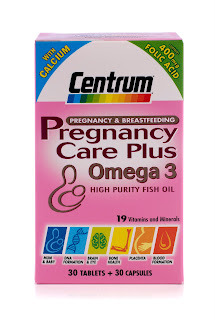 What Mellow Mummy says: I haven't yet tried the Centrum pregnancy care range but it seems to be an all-round pregnancy supplement that offers vitamins, minerals and, (in the case of the 'Plus Omega 3' version) and additional fish oil gel. Buy From: Supermarkets and pharmacies from £5.29. There are very few toys that are as universally popular among toddlers as a play farm. Fisher Price sent Lara one of their Fisher Price Little People Animal Sounds Farm to review. I shall admit that, given Lara's cousin, grandparents and nursery all own an ELC Happyland farm, I found it hard NOT to make a direct comparison with the ELC equivalent. My initial reaction what that the Fisher Price Little People Farm was a lot more impressive in size, colour and quality (although it did seem a shame that it was so clearly modeled after an american Barn). The Fisher Price farm didn't need any assembling (phew) but it does require batteries if you want the animal sounds. The farm makes different noises when you open various gates and doors on the farm. Perhaps the most entertaining element of the toy is the sliding chicken who makes a clucking noise as it innocently pushes the other animals and the farmer himself out of the window and down the roof!!! Lara enjoys putting all of the animals in through the top of the tower and then opening the door at the bottom to retrieve them. In fact, Lara likes filling the tower with anything she can get her hands on. Crayons, cars, her slippers! Every part of the product feels like it will withstand toddlerhood (it is designed for children from 1-5 years) - it is certainly a better-made piece of kit than the Happyland product. I would say that I find the noises and interactions with the toy a little disappointing and sometimes the interactive parts perplex me - I struggle to see the entertainment value in pushing the farmer out of the window or bouncing the sheep on the hay bale but I suppose it doesn't really matter what I think does it? Lara seems to enjoy all of the interactive parts and she certainly seems to like the toy animals. The Fisher Price Little People animals and farmer are great fun to play with in or out of the farm. They are big bold and chunky characters who really encourage Lara to role play. Lara owns a Little People DVD that she got free from a magazine or event some time in the distant past and, once she has watched it, she likes to play pretend games with farmer Jed to simulate what she has just watched! Cute. This week I felt the very first little wiggles from inside. Almost every evening since Wednesday I've been able to feel those telltale little 'butterflies' of movement. At one point I even exclaimed "ooh" and Mr. B. gave me a funny look. The bump is now starting to show and an otherwise lovely lady from work remarked on how huge it was for just 15 weeks. Thanks. Lara is very slowly beginning to get her head around the talk of a baby. She has gone from totally blanking me when I suggest that there is a baby growing in my tummy to now shouting "hello" into my naval and saying she can hear it crying! I'm beginning to notice the exhaustion kicking in but my body seems to save it all up for the weekend. It's really annoying because I like spending my weekends with Lara and at present I'm so tired that I end up taking naps in the afternoon at the weekends. During the working week though I seem fine - it just doesn't seem fair that my colleagues get my quality time. This coming week I have my first appointment with my consultant - a totally new experience for me. I have been referred for consultant-lead care this time due to my complex delivery last time and due to the unpleasant lasting side effects that child birth has left me with (the details of which I'm sure you don't want to know... especially if you've never given birth before). We have taken a few UK trips this year with our toddler Lara and we are planning at least one more trip this year in the run-up to Christmas. There are a few things I have learned about traveling with a toddler that are different to going on holiday with a baby. When Lara was 1, I wrote a list of travel essentials for when traveling with babies so I've decided to update my list with a few bits and bobs I can't live without now I have a toddler instead. Earlier this year I featured some essentials for eating out with babies and toddlers and established that a travel booster seat makes eating out a lot easier than trying to squeeze into a highchair or cope with a toddler who can barely see over the edge of the table. We take our booster seat everywhere. OK, so maybe Lara is a bit spoiled to be allowed to use my Ipod but on the last two trips we have made, I have been thankful for the Ipod and the apps I have downloaded for her to play with. Most recently, Lara stayed in the same hotel room as us which is tricky at bedtime when we want to watch TV and we want her to chill out - being unable to take enough bedtime story books to last the full holiday, I also took the IPod and each evening she would wind down with her favourite apps and when she was ready, she simply switched it off and tucked herself into bed! I guess this one kinda depends on what kind of holiday or trip you are planning. On our recent trip to Hereford we couldn't have done without it. 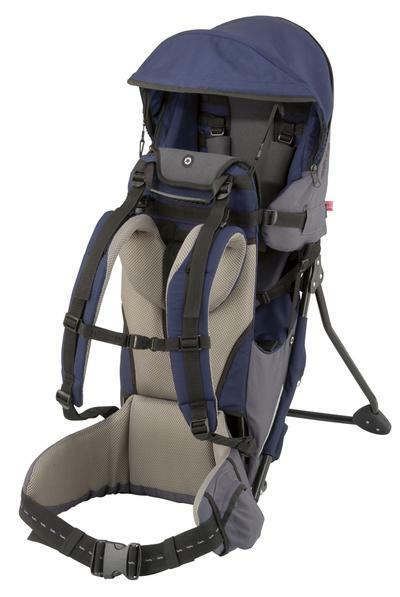 A toddler who is old enough to walk but too young to cope with long distances or steep hills really benefits from a baby/toddler carrier. You can see our video of the Kiddy Adventure Pack and see what we made of it but I think its perfect for trips where a buggy isn't appropriate. For some people this might not be an essential but we always choose to take our own on holiday because of Lara's sensitive skin. On the few occasions when we have either forgotten, or else decided to save the suitcase space and used the stuff that the hotel provides, Lara's skin has really suffered. Lara still wears a bib to eat and most pelican bibs are too bulky to pack enough. 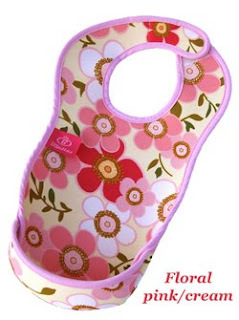 Our bibs are by Bibetta and we discovered them soon after Lara started weaning. They are so compact that I can fill the suitcase full of them! Ideal for whiling away the boring bits between the fun bits! Some of Lara's best masterpieces have been scrawled while waiting for our evening's entertainment.